Only a day after the Paris City Council gave its approval to bid for the Olympic Games in 2024, teams have quickly organized and planned a busy schedule for the next few months. Although the French Olympic Committee (CNOSF) has yet to officially decide whether to forward an application to the International Olympic Committee (IOC) before the September 15 deadline, the organization has become fully engaged in the process. French sports Website FrancsJeux.com reported Tuesday that a “pre-bid” committee is already in place and will hold its inaugural meeting on Wednesday (April 15) at CNOSF headquarters. The governance of the bid organization will be discussed among representatives of the state, Ile-de-France, the City of Paris and the sports federation. Then on Thursday French President François Hollande along with bid officials Denis Masseglia and Tony Estanguet will visit the Olympic Museum in Lausanne to meet with IOC President Thomas Bach – presumably to discuss the Olympic bid and France’s commitment to the Games. Then on June 3 an official bid delegation will return to Lausanne to engage the IOC in discussions taking full advantage of the new interactive “invitation phase” that the IOC introduced as part of the Agenda 2020 reforms. The official announcement to bid, which is now almost a certainty, could occur in June or July. The IOC will be holding its 128th all-members session that day and the announcement would likely make a significant impact on voting members as well as the gathered international media who will be on hand for the election of the Winter Games host in 2022 and the Youth Olympic Games host in 2020. Meanwhile on Tuesday, CNOSF released a new emblem for their organization that has a retro spin. The rooster, or “coq sportif” that was prominent on the emblem prior to 1998, is back in a more modern and abstract representation. 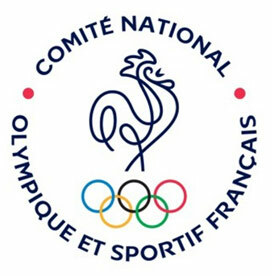 The rooster has been prominent in French history and culture and while changing its branding to comply with updated IOC rules, CNOSF took the opportunity to highlight it once again. The emblem, along with the hashtag #EspritCocorico, will help the French Olympic team prepare for the Rio 2016 Olympic Games and the bid campaign.